First rule of choosing good recipes- The grubbier, the better! If the page is sticky and brown and covered in ancient food, then it is a well used recipe that has been used many times. 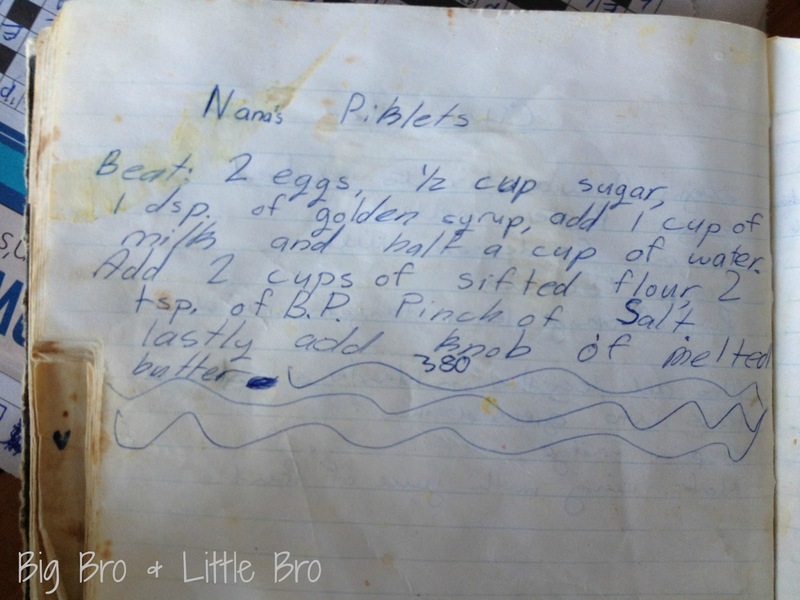 The terrible handwriting in this pic belongs to me when I was maybe about 12. And yes Pikelets is spelt wrong too. 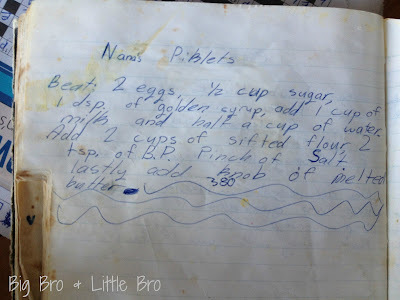 My Nana was a wonderful cook, and the funny memories she gave my brothers and cousins and I about gravy on every meal (even pizza) and the long barely-holding-together ash on the end of her cigarette when she cooked... Well, something made her food taste divine. dsp: (dessert spoon) - is just a spoon you would eat cereal or ice cream with. And as for the giant full stop and squiggly lines, I'm not sure. The trick is to turn the pikelets when the bubbles are just starting to pop. Serve straight away with marge and jam- even apricot jam for a change. Mmm what about whipped cream Oh naughty! Wrap leftovers in a clean teatowel.